The museum is proud of its collection of staffs one of the earlier ones being being a staff used by The 1st Surrey Militia c1800. In this photo from the left numbers 1 and 2 were presented by Lt Col R G G Clark CMG DSO. No. 1 to the officers' 1st Bn The Queen's Royal Regiment on the 18th October 1926. No. 2 was presented to the officers of the 2nd Battalion on the 1st June 1937. Both are silver and all the Regimental Distinctions and Battle Honours of the Regiment are depicted. Staff No. 3 belonged to the 22nd (County of London) The London Regiment (The Queen's) and bears the Battle Honour South Africa 1900-1902. It is silver and cane. Staff No. 4 belonged to 2nd Bn The East Surrey Regiment. The Roman numerals LXX and the Battle Honours including those of the First World War are shown. Staff No. 5 was presented to the 4th Bn The East Surrey Regiment by Colonel Bowen (commanding) on reaching its effective strength of 1005 and its full complement of combatant officers in 1898. Made of sliver and wood. Staff No. 6 was originally used by the 1st Vol Bn The Queen's which later became 4th Bn The Queen's (Royal West Surrey) Regiment TF. Made of silver, copper and cane. Among the treasured possessions of the museum is a Silverine Bugle, presented to the Museum by the late Gary Lockwood DCM, former RSM of 2/7th Bn The Queen's Royal Regiment. This instrument was the 'piece de resistance' of a full complement of drums and bugles presented to the Battalion by Col E A Rose, Honorary Colonel of the Battalion, when the Corps of Drums was reformed at Hythe in 1941, all the original instruments having been lost in France in 1940. 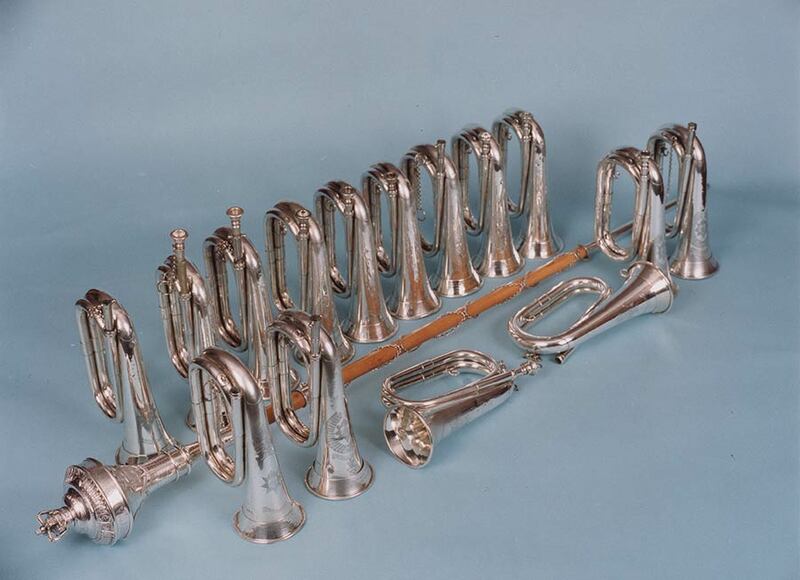 When the Battalion was posted overseas in 1942 the instruments were placed in a store but this bugle accompanied the Battalion on its travels. It was the Ship's bugle on the outward journey and was in use constantly thereafter, in India, Iraq, throughout the Western Desert to Tunisia and, latterly, in Italy. During its history it has been played by several well known Regimental characters, notably, 'Boy' English, Sgt Tommy Hazell and even Gary himself on occasions such as Christmas Day when the WOs and Sergeants took over all battalion duties. The Corps of Drums was reformed at Trieste in 1945 when the instruments were brought out from England but when the Battalion was disbanded in 1946 the instruments were sold and this bugle was purchased, it is thought, by a member of 2/6th Queen's during the absence on leave of the Commanding Officer, Lt Col (Later Brigadier) MacWilliam. He subsequently, 're-acquired' it by means known only to himself and presented it to Gary Lockwood. After the First World War a set of eight Queen's Royal Regiment side drums were emblazoned with the Battle Honours and Distinctions of the Regiment, but with no battalion ribbon within the design. These were paid for by the officers of the Regiment, regular and territorial to commemorate the officers, non-commissioned officers' and men of the Regiment who had been awarded the Victoria Cross. This set of drums was kept at the Depot. Early in the Second World War there was a fire in the store containing the drums and all disappeared, believed to have been destroyed in the fire. 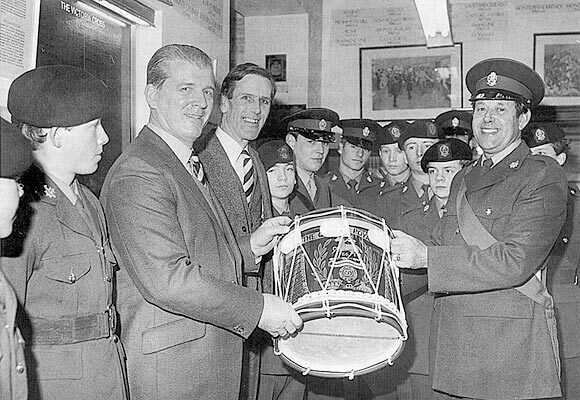 After the opening of the museum of the then Queen's Regiment in Dover Castle, the Curator was telephoned by an adult Warrant Officer instructor from the Farnham detachment of the Army Cadet Force, saying that a drum had been given to one of the cadets and asking if the museum would care to have it for the collection. On first inspection the drum was in a very bad condition but it was restored to its former glory with the co-operation of Mr David Leach of Potters of Aldershot. The photo shows the drum being handed over by the cadets at Dover Castle, to the Curator Lt Col Les Wilson. Lt Col John White from RHQ The Queen's Regiment is also in the photo. Close inspection reveals an engraving on the reverse side of the drum 'To the memory of Lt Col C Bushell VC DSO killed whilst commanding 7th Bn The Queen's (Royal West Surrey) Regiment'. 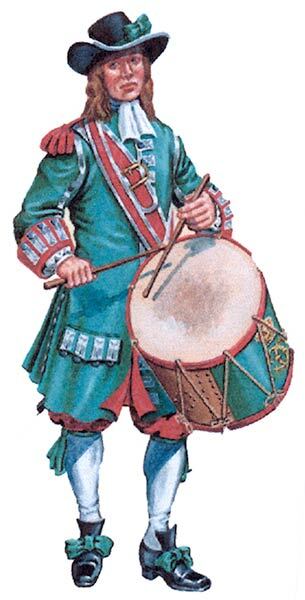 The drum had been purchased from a 'bric a brac' shop by a gentleman in 1951 for three pounds ten shillings and had been in his attic until his death, when one of the relatives was 'going to throw it on the tip'! The receipt was also handed over. Maybe, just maybe the other VC drums are out there -somewhere? In April 1966, a Drum Major's Staff of The Queen's (Royal West Surrey) Regiment which was "lost" during the first battles of the Somme in 1916, was found in New Zealand. It had apparently "come into the possession of" a Captain Cranworth Franklin Jackson, a New Zealander, in July 1916. Captain Jackson was in England at the outbreak of the 1914-18 War and joined a "London Regiment". So far, it has not been possible to identify the unit. Jackson returned to New Zealand after the war, presumably with the Staff, where he died in 1930. 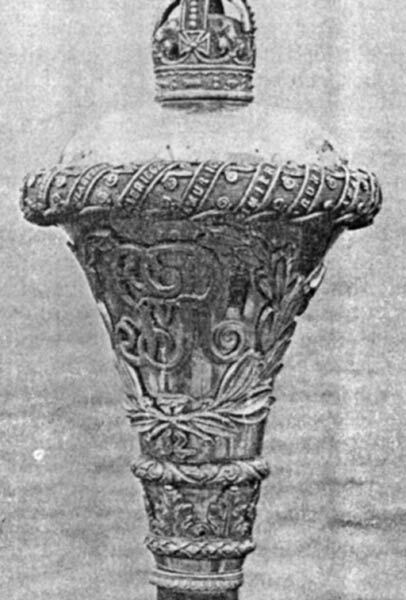 The Staff was passed to his brother-in-law, a Mr Claude Watson, who handed it over to the the British Liaison Staff in Wellington, New Zealand. They arranged for it to be put aboard HM Yacht "Britannia" which sailed from Wellington on 27th April 1966, after the visit of Her Majesty Queen Elizabeth the Queen Mother, to that country. The Staff finally arrived in Portsmouth in August 1966, where arrangements were made for HMS Excellent to receive it. It was collected from there and is now in the Regimental Museum. It is interesting to note that the Captain of the Britannia in 1966, Commander I R Bowden RN had two brothers who served in The Queen's Royal Regiment. The Regiment expressed its gratitude to him and the many people who were instrumental in returning the Staff to its rightful home. 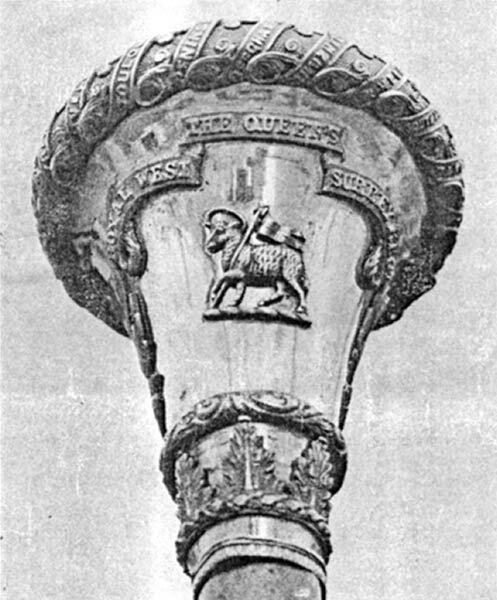 The Staff is believed to have belonged to either 1/22nd or 1/24th London Regiment (The Queen's). 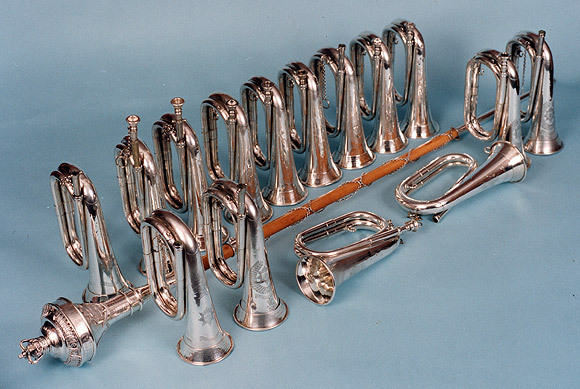 The photo shows fifteen of a set of sixteen bugles which were presented to 1/6th Surreys in 1928 by various towns and individuals in the 1/6th recruiting area. The drum majors staff was presented to 3rd Bn The Queen's Royal Surrey Regiment (TA) by the Borough of Guildford. The bugles are used regularly by the Corps of Drums, 3rd Bn The Princess of Wales's Royal Regiment. 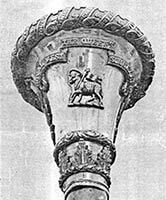 The Staff was returned to Guildford Borough Council and is now on display in Guildford Town Hall.